Coming off a well deserved Emmy Award win this week for his performance in the HBO series “Barry,” you would think Henry Winkler would be hitting up Hollywood parties in style, but the iconic actor is actually dreaming of his upcoming fly-fishing adventure to Montana and a recent family expedition in Idaho, all while dusting his new Emmy statue. 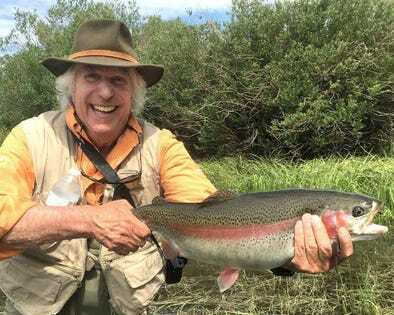 An accomplished sportsman who meticulously records the measurements of every fish he hooks, actor Henry Winkler has learned that his seasonal fly fishing trips throughout American rivers are not just about catching trout. They are about adopting the proper perspectives on life, where fly fishing recharges him and reminds him that anything is possible. Fly fishing was one of the biggest challenges he ever took on and became successful at, which boosted his confidence. The beauty of the sport and the landscape inspired his interest in photography, and subsequently, he wrote the bestseller “I’ve Never Met an Idiot on the River” where he reflects on his family, photography and his extreme passion for fly-fishing. I sat down with Henry at his rambling, modest estate in Los Angeles where we spent hours talking about his love for the sport and how to this day he will never eat a trout. Winkler is one of those rare souls in Hollywood that welcomes you with an open heart and instantly makes you feel comfortable and at home. Just don’t enter his sacred space when he is fishing, and all will be fine.